The International Robot Exhibition just kicked off in Tokyo. The exhibits are featuring robot farmers, entertainers, elderly helpers and disaster relief first responders. But SoftBank's Pepper has stolen the show. 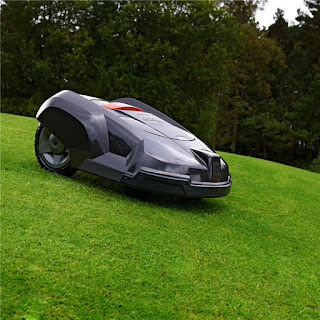 The latest version of the humanoid robot is getting rave press reviews. It's an emotional humanoid that's 4'4" tall. Pepper moves around on wheels and according to initial reviews, it's charming, chatty, considerate, reads human emotions, offers good advice and loves to make small talk. One Japanese journalist said it provides you "arduous attention". And, it's a hot seller. In fact, out of the box it was a sell-out. SoftBank continues to develop it including new jobs for it to do. Pepper's work experience starts with duty in homes. But it's also successful in customer service at shopping malls, train stations and banks. Pepper is conversant in 20 languages. It can recognize faces, remembers names and previous interactions. It's equipped with recording equipment that captures video and voice. Pepper just got hired by HSBC as a digital greeter at its 5th Avenue New York City bank branch. It goes up to customers and asks if it can help. 5th Avenue is just the beginning. HSBC plans to roll out the robots at other branches to customize and personalize the banking experience for its customers. 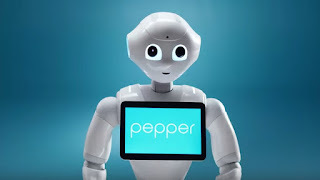 Meanwhile, Pepper's just been hired by several hospitals in Belgium as a receptionist to talk with patients and help reduce their stress about being in a hospital. It's a big part of the new global robot workforce coming to restaurants, banks and other businesses near you.